Double H Agency has selected a new brand for his portfolio. This time, the fashion agency has picked a brand to make wider the offer of the agency. Double H Agency has selected a new segment for his showroom, the underwear German brand “Happy Shorts“. Happy shorts has launched the brand 2 years ago. They are becoming one of the trendiest brands in Germany. That’s the reason why Happy shorts has settled a new movement inside the brand to increase his presence in the European markets and selected Double H Agency to become his partner in the UK. The underwear men’s brand, it is specialised in trendy and fancy designs in boxers and retro shorts with jersey material and others. The brand is offering a complete range of sizes from S to 2XL. As well, they offer different package options from 1, 2 or pack of 3. These commercial options are completed with a display furniture to have a better presence in the shop and completed with an aggressive markup. 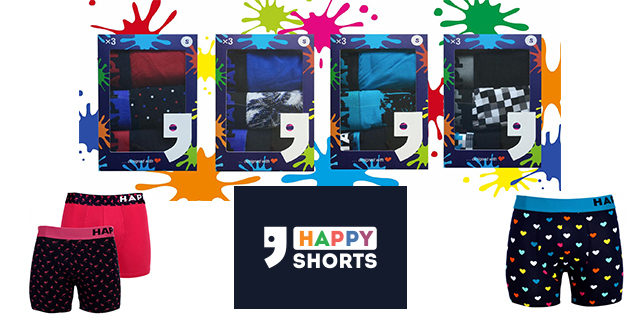 Finally, Happy Shorts has launched this season a small collection of swim shorts. They also offer a competitive price to make it attractive and complement the underwear offer from the brand. With this new project, the brand would like to make wider the opportunity to have them as a partner. All these reasons, make Double H Agency, after Moda meeting, to take them on board to complete bit by bit the great menswear option that the agency is offering in the UK market. Happy Shorts complete the other 8 brands that Double H Agency: Garcia Jeans (Denim brand), Amov (ethical fashion), Eden Park (Premium brand), Carlos Cordoba (Shirts and chinos Spanish brand), Jt.Ascott (entry price shirts 100% cotton), S4 Jacket (high-quality Jackets) and Pat & Can (Premium Swimshorts Made in Sapin) is representing in the UK market with a new segment.